Middle school seems too full of changes for Amina. Their traditional uncle - her father's oldest brother - is coming from Pakistan to stay with their family. Her best friend, Soojin, has started hanging out with Emily and wants to change her name to Susan after her citizenship ceremony. Worst of all, her father signed her up to perform in a public speaking contest. Amina loves to sing, but only in private. Things are not going as planned. Although the character is in middle school, the book is pretty simple and straightforward. It mainly focuses on relationships, especially between Amina and her friend Soojin, and between Amina and her brother. However, it also touches on some other relationships, like the way her parents behave differently when their uncle is staying with them, and it describes a trickster at school and some family friends. Amina also has friends at her Sunday school, where she studies Arabic passages from the Quran and, through the book, she asks questions about religious teachings, such as whether or not it's wrong to study music and how guilty she feels about giving away a secret. 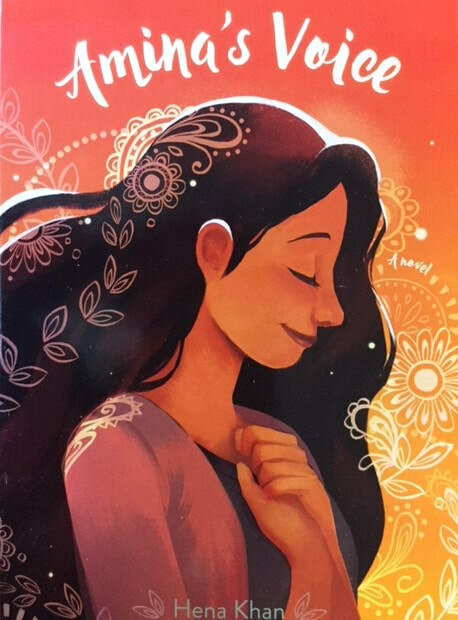 It's good to see a balanced portrayal of elements of Amina's life, from school to faith to family to friends, but her voice never really becomes the focus of the text - it's more about the way she responds to events and people around her. There is a hate crime represented in the book, and the story takes the opportunity to show community members coming together in response. "There's no point trying to tell them that speaking in front of a crowd is something I haven't gotten over, as much as everyone tells me I need to, or warning them that my Arabic performance is just going to embarrass them anyway."